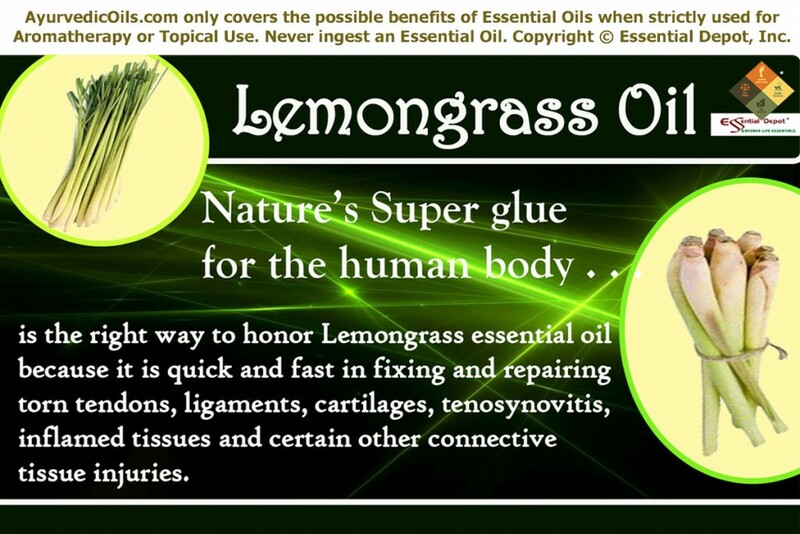 Nature’s super glue for the human body is the right way to honor Lemongrass essential oil because it is as quick and fast as any branded adhesive glue in repairing torn tendons, ligaments, cartilages, tenosynovitis, inflamed tissues and certain other connective tissue injuries. This oil smells heavenly and is much similar to the aroma of Lemon oil but with a comparatively gentle, sweet and soothing aroma. Used as a celebrated culinary herb in Thai and Chinese cuisines, Lemongrass is often used to substitute Lemon. This essential oil is extracted from the grassy leaves through steam distillation process. Ayurveda makes use of this ancient herb in treating weak digestion, poor circulation, poor concentration, fever, varicose veins, intestinal infections and certain infectious skin problems. Indigenous to the southern parts of India, this spectacular herb is also found growing in South East Asian countries including Indonesia, Malaysia, Thailand, Cambodia and Vietnam. It is also cultivated in United States especially in Florida and California. Lemongrass is a celebrated culinary herb in the Caribbean and Chinese cuisines. This aromatic herb blends well with garlic, ginger, cilantro and other spices used in flavoring a wide variety of Caribbean soups especially the seafood soups. Powdered Lemongrass has been used in Asia for giving incredible flavor to traditional dishes made with meat, poultry, seafood and vegetables. It is also used in spicing up pickles and marinades. Widely known as ‘Fever Grass’, Lemongrass is popular in the Asian countries since the primordial times for its ability to bring down fever and normalize the body temperature during hot weather. It is either used in tea or in foot-baths for reducing fever and excess heat in the body. This tea is also believed to treat ringworm, lice, scabies and few other skin problems. The Traditional Chinese Medicine used Lemongrass for treating headache, rheumatism, abdominal pain and cold. This herb was also a part of the Brazilian folklore medicine for calming the mind, treating muscular spasms, cramps and fatigue. Powdered along with black pepper, Lemongrass was used as a powerful Ayurvedic remedy for relieving menstrual cramps, nausea, irregular periods, fever and other infectious diseases. The remedial properties of Lemongrass essential oil are antiseptic, anti-rheumatic, diuretic, anti-inflammatory, astringent, analgesic, sedative, deodorant, galactogogue, nervine, tonic, carminative, antimicrobial, antidepressant, febrifuge, bactericidal, fungicidal, deodorant, antipyretic and nervine. 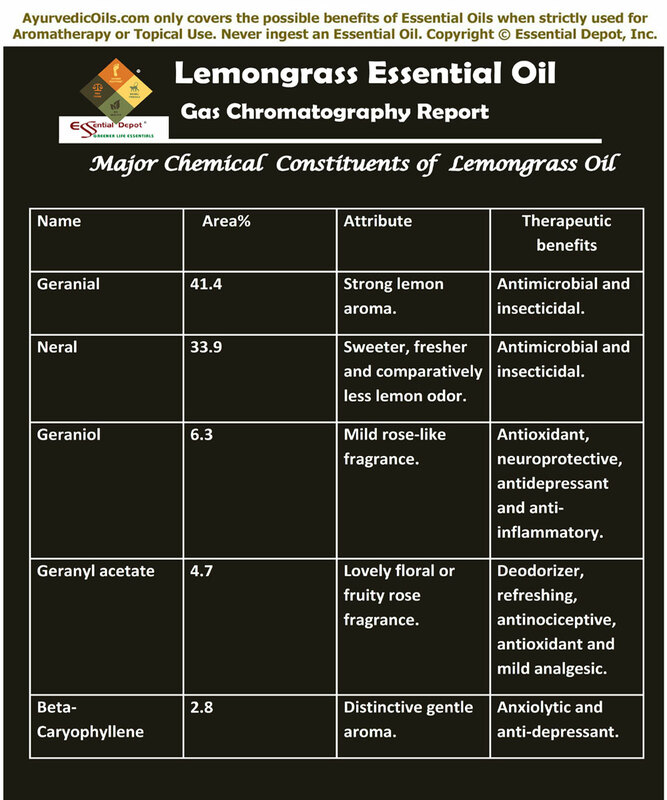 According to the Gas chromatography report, Lemongrass oil constitutes of 5 chemical components that contribute to its exotic fragrance, therapeutic properties and quality. The major chemical constituents of this oil are citral (Geranial and Neral – approximately 85% of the oil), geraniol, geranyl acetate and beta-Caryophyllene. 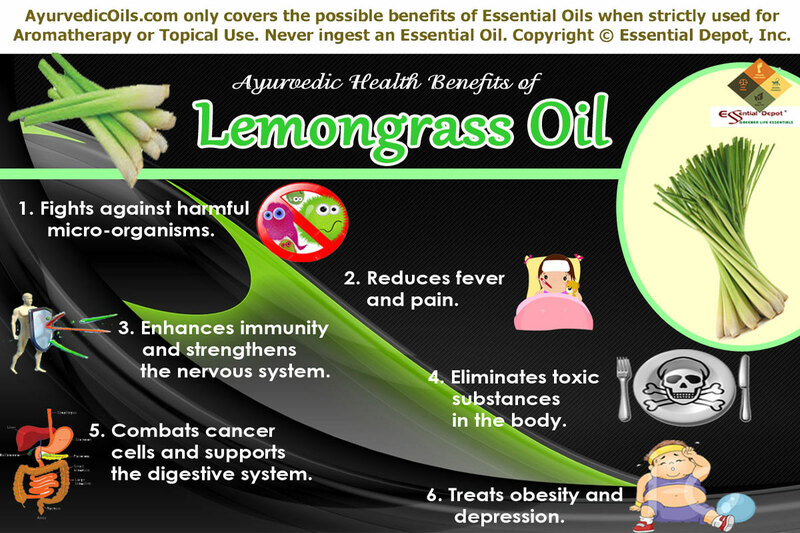 for getting to know more about the exclusive information of these key constituents of Lemongrass oil. The table below on the Gas Chromatography report talks about the principal chemical constituents and its role in granting the therapeutic and other attributes to Lemongrass oil. Ayurveda uses infinite number of herbs in the process of healing humanity and Lemongrass is one such vital herbal whiz kid that has been helping mankind in treating innumerable diseases. Known as Sera and Bhustrina in India, Lemongrass has been used in various Ayurvedic treatments for treating kidney infections, headache, problems with connective tissues, weak immune system and depression. More than 5,000 years old, Ayurveda is by far the oldest of all healing sciences on earth and is the Mother of other complementary and alternative medicinal practices like Siddha, Homeopathy, Aromatherapy, Chiropractic, Acupuncture, Homeopathy, Traditional Chinese Medicine, Unani and much more. This science of wisdom has left behind innumerable complex healing systems using simple methodologies. The ancient Ayurvedic philosophers Charaka and Sushruta encompassed the most important Ayurvedic remedies for all sorts of diseases. The most intricate medical practices even with today’s contemporary medicinal equipments and techniques are C-section surgery and Plastic surgery. Won’t you simply be amazed if I say that these two were a part of the Ayurvedic treatments???!!!! Yes. Sushruta is called as the father of Plastic surgery and C-section deliveries were executed for the most critical cases where the baby or the mother turns breathless at the time of delivery. The magnificence of Ayurvedic healing lies in its trust and usage of natural remedies like herbs, healthy and balanced diet, essential oils, yoga, simple physical exercises, meditation with an Ayurvedic routine. This aims at treating illnesses, preventing them in future along with healthy aging. Ayurvedic texts define health as a combination of physical, mental and spiritual wellness. Every human being is made of a unique individual constitution that comprises of three biological energies known as doshas namely pitta, vata and kapha. A person’s physical setup, personality and behavior are determined by the predominance of any one of these doshas. Imbalance between these doshas is responsible for ill-health and Ayurvedic remedies focus on balancing these doshas. Lemongrass essential oil alleviates excess kapha and pitta dosha while it has a neutral effect on vata dosha. Lemongrass essential oil has been proved effective against micro-organisms like bacteria, fungi and certain other microbes. Few studies witnessed that Lemongrass oil is more potent than streptomycin or penicillin in fighting against staph infection. Staphylococcus is the major bacterium responsible for making wounds turn septic. Applying 2 drops of Lemongrass oil mixed with 15 to 20 drops of coconut oil on wounds, cuts, acne, burns, sores and other skin infections aids in healing the wounds and curbs the growth of micro-organisms that worsen skin problems. This effect can also be attributed to the antiseptic properties of this oil. A 2008 study on ‘Antifungal activity of the Lemongrass oil and citral against Candida spp’ state that Lemongrass essential oil and citral are effective against various types of yeasts of Candida species including Candida albicans, Candida glabrata, Candida krusei, Candida parapsilosis and Candida tropicalis, proving its potent in vitro activity against Candida spp, responsible for the most common fungal infection Candidiasis. Certain other studies suggest that Lemongrass oil can also assist in combating the growth of fungi like Alternaria alternata, which is said to cause infections in the upper respiratory tract. Gently massaging your body with 5 drops of Lemongrass oil blended with 2.5 ml olive oil can assist in inhibiting the growth of bacteria and microbes both externally and internally. This aids in treating microbial infections in the respiratory system, skin, stomach, colon, urinary tracts and other parts of the body. Being an anti-pyretic and febrifuge, the essential oil of Lemongrass reduces fever by fighting against infections causing fever, promote sweating and by eliminating the harmful toxins in the body through urine. According to the Ayurvedic philosophy, pitta dosha is responsible for body temperature and fever is an indication of increased pitta energy. Lemongrass essential oil is known to reduce pitta dosha and by this way it lessens the body temperature even during high fevers. Add 2 drops of this oil in warm water for a remedial foot bath for reducing fever or massage your foot soles with 2 drops of Lemongrass oil mixed with 1 ml of coconut oil for relief from fever. This oil also lessens excess of kapha energy that causes fluid retention in the body causing respiratory problems, rheumatism, pain and inflammation. Gently massaging the painful areas with 2 drops of Lemongrass oil mixed with 1 ml of sesame oil helps in relieving pain, inflammation and rheumatism by eliminating the excess fluids and toxic substances through urine and sweat. The analgesic action of this oil helps in soothing pain, tired muscles, headache, joint pain and back pain. Lemongrass herb and its essential oil have excellent nutrients and chemical components that benefit the entire system and augment the immune power, which makes the body naturally resistant against diseases. It acts as a tonic to the human body and strengthens the functioning of the digestive system, nervous system, excretory system and respiratory system by stimulating the process of absorbing essential nutrients by the body. Lemongrass oil is used in Ayurvedic massaging for fortifying the nerves, limbs, muscles and tissues. Massaging your body with 6 drops of Lemongrass oil blended with 3 ml of olive oil can assist in treating nervous problems like vertigo, convulsions, Alzheimer’s disease, sluggishness, Parkinson’s disease and nervousness. Stagnation of ama (toxic substances) in the body is one of the primary reason for illnesses according to Ayurveda. The diaphoretic and diuretic properties of Lemongrass Oil increase the frequency and quantity of urination through which the harmful toxins in the body are vented out. This action also aids in improving digestion, cleansing the kidneys and discharging harmful infection causing foreign bodies. You can add 2 drops of Lemongrass oil in warm bathing water or in foot bath or massage your body with 3 drops of this oil with 2 ml of sesame oil for getting rid of all the toxic substances from your body. A 2009 study on the anticancer activity of Lemongrass essential oil against 12 human cancer cell lines proved that Lemongrass oil “has a promising anticancer activity and causes loss in tumor cell viability by activating the apoptotic process as identified by electron microscopy.” Certain other studies also state that the presence of a-limonene and geraniol showed inhibition of cancer cells in intestinal mucous membrane and liver in mice. Excess of pitta energy causes cholera, flatulence, intestinal gas and weak digestion. Lemongrass essential oil reduces pitta dosha and normalizes the process of digestion. Gently massaging your abdomen with 2 drops of Lemongrass oil blended with 1 ml of sesame oil will assist in improving digestion. Inhaling the aroma of this oil by applying 1 drop of Lemongrass oil on your wrist or to your hankie can stimulate weak digestion. Obesity is a universal problem and excess of kapha dosha causes fluid retention, excess deposits of fat and stagnation of water and other toxic substances in the body. Stress, tension and depression also cause metabolic changes and contribute to obesity. Lemongrass essential oil lessens kapha dosha by decreasing the appetite, removing excess water and fat deposits from the body through urine and sweat. A study by the Department of Nutritional Sciences of University of Wisconsin studied the effect of Lemongrass and cholesterol in 22 people with high levels of cholesterol where they took 140mg of lemongrass oil capsules daily. This study came up with an amazing result where the cholesterol level was reduced from 310 to 294 on an average basis, which was a significant amount of decrease in the amount of blood fats. Using 5 drops of Lemongrass oil blended with 2.5 ml of coconut oil as a massage oil or 3 drops of this oil added to warm bathing water can help in discharging excess fat, water and fluid retention in your body and helps you in reducing your excess weight. In the book ‘Ayurveda and Aromatherapy’, Bryan Miller states that Lemongrass essential oil is an excellent antidepressant oil that can assist in alleviating stress, depression, fatigue, negative feelings, emotional trauma and distress. Using 2 drops of Lemongrass oil in vaporizer, burner or diffuser can assist in driving away negative emotions, insomnia, loneliness, emotional instability, mental stagnation and lack of self-confidence. The Journal of Ethno pharmacology published a 2011 study, which stated that Lemongrass essential oil possess anti-anxiety properties that would aid in lessening anxiety by stimulating the brain levels of the neurotransmitter gamma-amino butyric acid. Lemongrass essential oil is also a great natural remedy for treating menstrual problems and its galactogogue properties help improve the quality and quantity of breast milk in nursing mothers. It is a trusted insect repellant and can also serve as a natural air freshener with its refreshing aroma. Pure and organic essential oils are highly concentrated liquids so never take them internally. Always remember to dilute essential oils before using it topically. This article is only for the purpose of education and is not meant to diagnose or replace any prescribed medicines or professional advice. Consult your Ayurvedic practitioner before using essential oils that would fit your unique individual constitution and state of health. 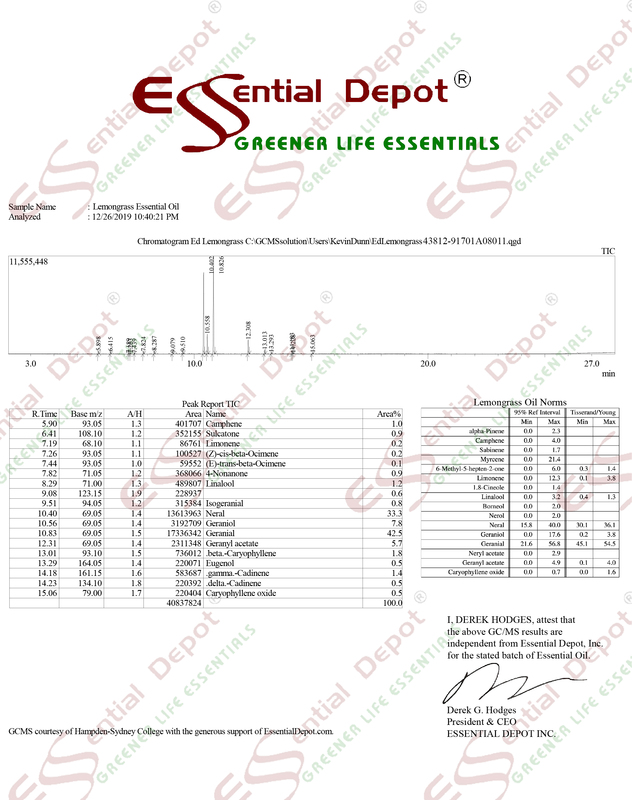 The MSDS (Material Safety Data Sheet) of Lemongrass oil is readily available for your enhanced safety and optimal usage. This entry was posted in Essential Oils - Learn About and Purchase and tagged Ayurvedic health benefits of Lemongrass essential oil, Ayurvedic oils for cholera, Ayurvedic oils for depression, Ayurvedic oils for fighting against infections, Ayurvedic oils for menstrual problems, Ayurvedic oils for nervous problems, Ayurvedic oils for obesity, Ayurvedic oils for stress, Ayurvedic oils for weak digestion, Ayurvedic remedies for detoxification, Ayurvedic remedies for fever, chemical constituents of Lemongrass oil, Essential oils for obesity, Gas Chromatography Report of Lemongrass oil, Health benefits of Lemongrass essential oil, Lemongrass in Ayurveda, MSDS of Lemongrass oil, Natural insect repellants, Natural remedies for depression, Therapeutic properties of Lemongrass oil by AyurvedicOils. Bookmark the permalink.